The perfect gift for all your off-roading friends and family! 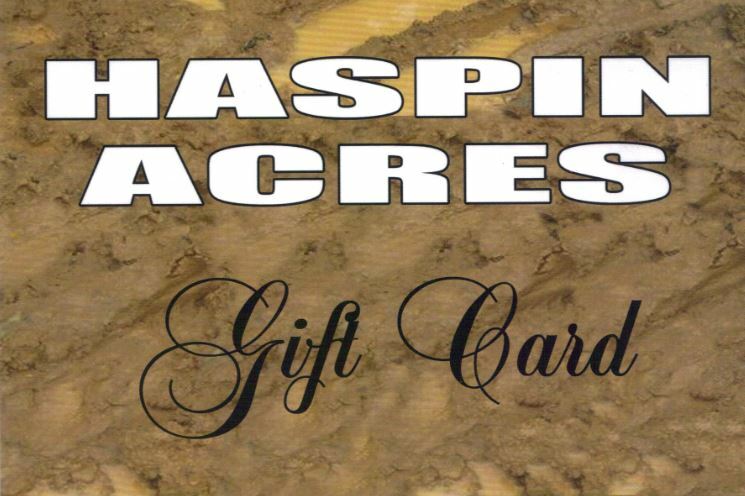 Whether it's for a birthday, holiday, or "just because," a Haspin Acres Gift Card is a present you can be sure they will enjoy! IMPORTANT INFORMATION ABOUT GIFT CARDS FOR MINORS! Parents of children under the age of 18 are REQUIRED to sign a waiver of liability form for each child. IF A CHILD UNDER THE AGE OF 18 COMES TO HASPIN ACRES WITHOUT HIS OR HER PARENT OR GUARDIAN PRESENT, THEY MUST BRING A SIGNED WAIVER FORM WITH THEIR PARENT'S SIGNATURE, AND THE FORM MUST ALSO BE NOTARIZED BY A NOTARY PUBLIC! IF THEY DO NOT HAVE THE SIGNED WAIVER FORM OR IT IS NOT NOTARIZED, THEY WILL NOT BE PERMITTED TO ENTER THE PARK! IF THE FORM IS SIGNED BY HIS OR HER PARENT BUT HAS NOT BEEN NOTARIZED BY A NOTARY PUBLIC, THIS IS NOT ENOUGH -- IT MUST BE NOTARIZED! WE CANNOT ALLOW THEM INTO THE PARK IF THE FORM HAS NOT BEEN SIGNED AND NOTARIZED!